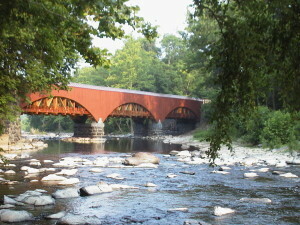 Point Pleasant lies on both sides of Tohickon Creek by the creek’s confluence with the Delaware River; the creek is the dividing line between the townships. This area was originally settled by the Lenape Indians who fished in the Delaware River. Its proximity to the river led to the development of grist mills and, during the Revolutionary War, grain for the soldiers was ground here. Point Pleasant was also resting spot for canalmen along the Delaware Canal, and a waystation for the Doylestown-Frenchtown-NewYork stagecoach.